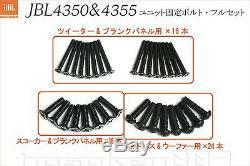 Unit fixing bolt set for JBL4350,4355 from JAPAN F/S. It is a steel bolt similar to JBL genuine, black plating finish. Set content · Tweeter & blank panel x 16 · Squawker & blank panel x 16 · Midbus & woofer x 24. Please let me know if you have any questions. Also, please tell me if you have what you're looking for in Japan items. International Buyers - Please Note. The item "Unit fixing bolt set for JBL4350,4355 from JAPAN F/S" is in sale since Thursday, August 17, 2017. This item is in the category "Musical Instruments & Gear\Pro Audio Equipment\Other Pro Audio Equipment".